Farhad is not alone. Over a million people in Bangladesh live with a disability. They live a life of limited mobility, facing difficulties in accessing public spaces. According to Bangladesh Inland Water Transport Authority (BIWTA) data, 71.34 million travels took place in the various water transports in 2018 only through the Sadarghat terminal, while the number is a staggering 280 million all over Bangladesh. 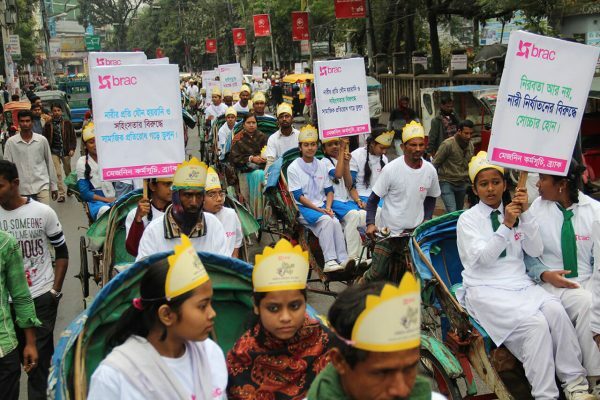 BRAC’s advocacy programme has been working towards ensuring accessibility for people with disabilities in Bangladesh’s transport and infrastructure. The six-month intervention has finally come into fruition: the Ministry of Shipping has issued an official circular to ensure accessibility for persons with disabilities across every port in Bangladesh. The effort came into reality with assistance from the National Human Rights Commission (NHRC). BRAC has also been requested to provide recommendations to create an inclusive water transport system across the country. People with disabilities are one of the most marginalised groups in Bangladesh. Something as basic as going to work or attending school become a critical task because of the lack of facilities in place. Disability inclusion is a strategic priority for BRAC, with the advocacy programme addressing the issue from both policy and implementation levels in collaboration with the NHRC. Section 32 of the Rights and Protection of Persons with Disability Act, 2013 directs that 5% of the seats in any public transport should be reserved for persons with disability. The reality however, is far from it. A major overhaul in existing and new transport systems is crucial. We reached a milestone last December when we arranged a stakeholder consultation to support the government in ensuring accessibility for the new metro rail service in Dhaka, which is currently under construction. We signed an MoU with NHRC to work together for the next two years on ensuring accessibility of infrastructure, public transport, and information for persons with disabilities. A number of recommendations came directly from people with disabilities, who were in attendance at the consultation event. These included separate ticket counters, trained staff to support a traveller with disability, bright colours and braille for footpaths, lifts and platforms, among others. An inclusive society is one where everyone can participate and live with dignity, regardless of their physical abilities. It starts with making our public spaces accessible for all, so that bright young people like Fahad are not left behind. Shahrin Ahsan is a manager at BRAC Advocacy for Social Change.